Paper cups are normally made in heavier weight board to give extra heat insulation,coated PE/PLA on the inside,suitable for all hot and cold drinks,They are available fully printed with your own cup design or designed by our in-house design team to your specification.Effectively build and promote your brand in the marketplace, increase your sales, and results in better brand image and customer engagement. PE Coated Paper is used for heat sealing bags for sugar, coffee, salt, etc. Paper is available for white, brown kraft paper, art paper, grease proof paper, etc for food packaging. The sealing strength is brilliant for small, middle and large bags or pouches. With customized logo printing, your bags could stand out in the market and get popular. Non-woven fabrics have many advantages: 1) air permeability 2) filterability 3) insulation 4) water absorption 5) waterproof 6) stretch 7) not disheveled 8) feel good, soft 9) light 10) Recovery 11) without the direction of the fabric 12) compared with the textile production of high productivity, production speed 13) low prices, can be mass production and so on. The exact name of the non-woven shall be nonwoven, or nonwoven. Because it is a need to spun the fabric and the formation of the fabric, but the textile short fiber or filament orientation or random arrangement, the formation of fiber structure, and then use mechanical, thermal or chemical methods such as reinforcement. Nonwovens break through the traditional textile principles, and has a short process, production speed, high yield, low cost, wide use, raw materials and more features. Fiberglass insulation material is the combination of laminating an aluminum metallic/film heat shield to a layer of protective fiberglass insulation protects personnel or equipments by reflecting radiant heat. 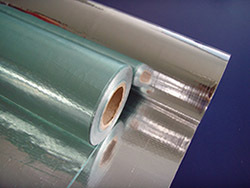 Suntex uses the high temperature adhesive to ensure the maximum working temperature up to 150 0C.-One side or both sides aluminum foil/film laminated available. What is Desiccant Packaging paper? Desiccant packaging paper requires good breathing quality. Our specialty paper is eco friendly, food grade. It is a perfect material for desiccant packaging, Widely used in food, electronics, electrical appliances, machinery, hardware, handicrafts, instruments, meters, clothing, shoes and hats and other products for storage and transportation in control the relative humidity of the environment, to prevent the goods be affected with damp be affected with damp, mildew or rust. For Electronic components (PCB, IC, HD driver),precise equipment and chemical raw material etc.